Carriageworks and Performance Space present a new large-scale installation by leading Brisbane-based sculptor and media artist Ross Manning titled Melody Lines as part of the Liveworks Festival of Experimental Art. 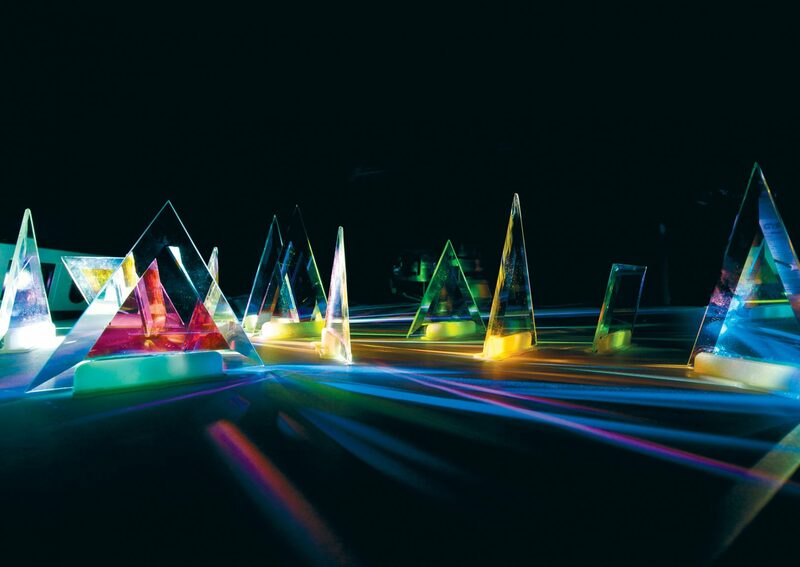 Presented free to the public from 20 October until 6 November 2016, Manning’s work will weave through Carriageworks’ public space like a multi-dimensional drawing, carrying a stream of objects that split and refract light into many-hued colours and spectra. ROSS MANNING: MELODY LINES is a monumental new kinetic sculpture that will animate Carriageworks’ architecture with an ever-moving investigation into form, colour and light. Suspended from the ceiling, an intricate system of conveyor tracks of a similar type used for assembly lines and other industrial manufacture will respond to the history of Carriageworks as a site of industrial production. The overhead conveyor will weave around the space, ferrying numerous transparent coloured pendants that create an ever-shifting array of coloured light and shadows. Carriageworks’ interior is transformed into a dreamlike landscape in a perpetual state of motion and flux. An enthralling meditation on perception and the senses, Melody Lines invites us to reconsider our surroundings and bask in its astounding radiance. The installation will be the centrepiece of Performance Space’s Liveworks Festival of Experimental Art. During the daytime, the sculpture will be illuminated by the natural sunlight streaming into the Carriageworks’ public space and as night falls and more audiences arrive for Liveworks, a more theatrical lighting system will be activated, projecting light into the sculpture at new angles and intensity and revealing new forms and facets of this intricate and complex installation. This is the second collaboration between Carriageworks and Performance Space following the success of the major co-commissioned exhibition by Torres Strait Islander artist Ken Thaiday Snr in 2014. ROSS MANNING: MELODY LINES, is co-curated by Jeff Khan, Artistic Director of Performance Space, and Nina Miall, Visual Arts Curator at Carriageworks.